I will be performing music never heard before and featuring live art from modern artist MISCASSTELLE. That’s all I can say for now, hope to see you in 3 days. My newest visual for my newest song spacewalk released 6.8.15 Thank you very much for visiting the site, watching the video and giving support to my self educated ways of showing unconditional love. May The Force of much love & good vibes be with you. Even though it’s not Thursday inlew of The Life Of RoD Season 4 coming 6/28/15 I decided to Post one of my favorite episodes from season 3. This is the first of many videos coming your way. Happy first day of summer & fathers day. 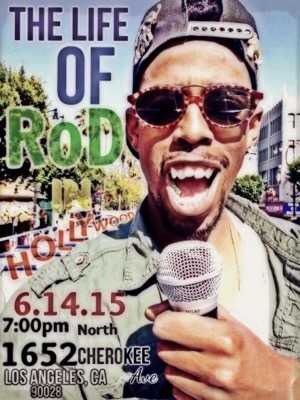 Come be apart of The Life Of RoD in Hollywood, see the founder of Your Own Understanding spread the message of Self Education, support, & unconditional love. Click the Link below to purhasce tickets for this Y.O.U. Event! The first 20 tickets come with a Y.O.U. Bucket Hat!